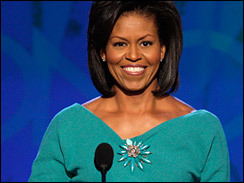 SHEfinds / Style / Michelle Obama To Be The Next Jackie O? 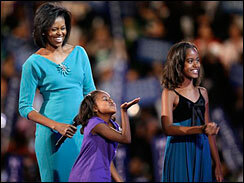 Michelle Obama To Be The Next Jackie O? People can't stop talking about what Michelle Obama wears (including us), and after her appearance last night at the Democratic Convention in Denver, I finally know why. This woman knows who she is and what to wear to complement her shape as well as let her stand out without being obnoxious. In a turquoise blue, three-quarter-sleeve sheath-like, fitted, Fifties-inspired style in double-faced wool dress made by designer and fellow Chicagoan Maria Pinto, the future first-lady hopeful addressed the nation. Surprisingly enough, the pendant was not part of this design but taken from Michelle's own jewelry box for an extra touch of flair. Do we have a budding fashion icon on our hands? Only time will tell! Keep an eye out on Maria Pinto – if Michelle makes it into the White House, Pinto could very well be the next iconic designer as Chanel was to Jackie O. What do you think of Michelle's style? Let us know in the comments section below.